There has been a lot of hype about tonight’s supermoon and the lunar eclipse. Even I was intrigued. 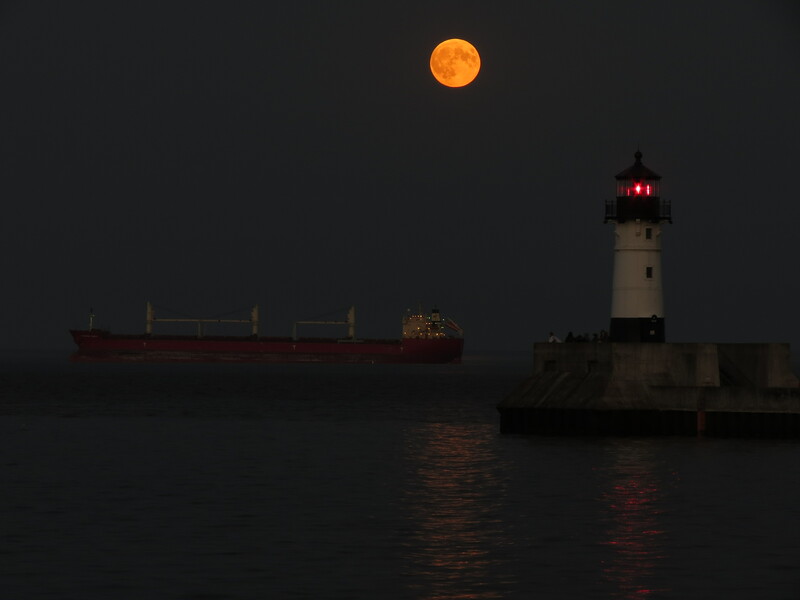 So when Rich headed down to Canal Park to photograph the rising moon, I decided to accompany him. The decision wasn’t difficult. It was a beautiful mild evening, very calm and inviting. Even if I didn’t get any great photos, it would be a pleasant outing. As soon as we arrived, we noticed another photographer heading for the Lakewalk. He had a fancy camera atop his high-end tripod that he carried over his shoulder in a rather cavalier manner. In the other hand, he held a case that could only hold a huge long lens. It looked like we were in the right spot. We set up shop near the corner of the Lakewalk and awaited the moon’s arrival. 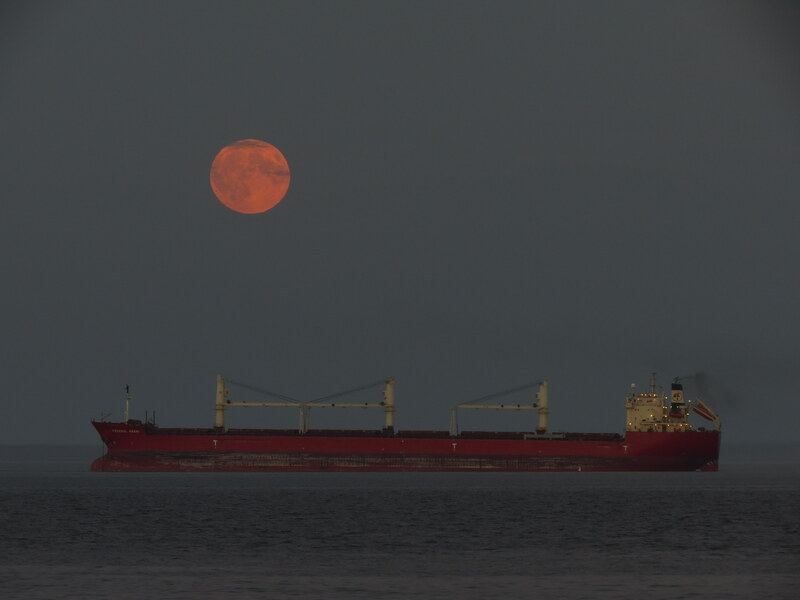 With two foreign freighters anchored in the lake, we tried to position ourselves so that the moon would rise near one of them. But we wouldn’t know until it came up. As we waited, an aura of expectation developed along the Lakewalk. Nearly everyone sported a camera around the neck. And the population of tripods rapidly increased along the shoreline. It was a couple of walkers who ultimately clued us in to the rising moon when I overheard them pointing it out. It was so faint on the horizon that we could hardly see it – a light blue orb blending in with the murky distant sky. And it was in the wrong spot. Or more accurately, we were. Hefting our tripods, we rapidly headed closer to the bridge where we could get a better angle. By the time we moved far enough to capture the moon with one of the ships, the moon was far more distinguishable and took on an orange glow. Now it was getting more interesting. Schlepping our gear closer yet to the pier, we found an even better view. 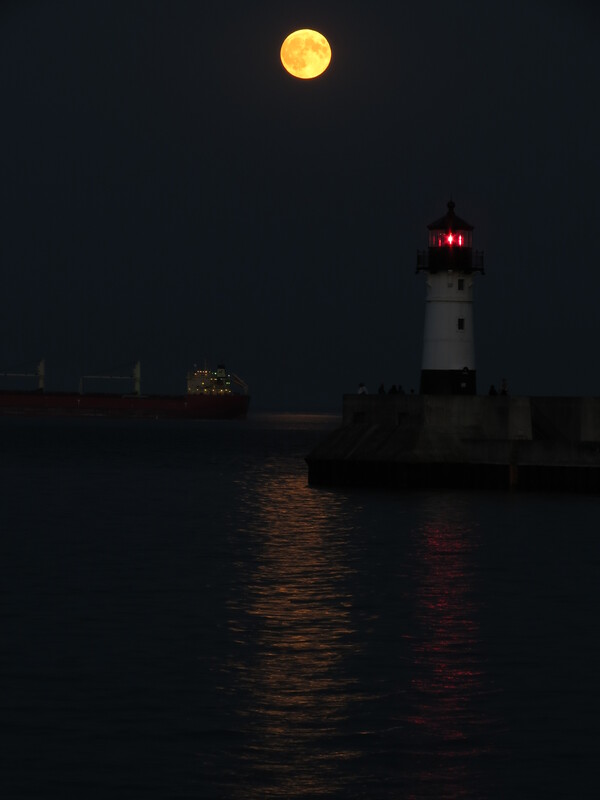 We could combine the moon, the freighter and the lighthouse. Soon we were synchronizing our snapshots with the flash of the lighthouse’s beacon. The higher the moon rose, the better its reflection. By this time we were surrounded by other photography enthusiasts, all enjoying the spectacle. The camaraderie was infectious, and rather than being competitive there was common rejoicing whenever someone captured an exceptional image. Indeed, it was a beautiful night to be shooting the moon. Hi, Molly, From our friend’s Gulf Shores, Alabama condo, I enjoyed catching up with and reading several of your recent blogs, including the Shooting the Moon brief, the title for which had a quite different meaning for me in my wild college days. Glad to know you and Rich did a little hiking after all near Grand Marais after the writer event. Thanks for including that as well as all the terrific photos. Beryl and I enjoyed two nights in the French Quarter of New Orleans and lots of walking to tour the old area. Shiloh, TN and Corinth, MS Civil War sites were very moving for us, but good cheer at a retro “Barroum’s Drug Store”‘ with it”s famous 89 year old, 67 years long first ever female pharmacist in Corinth – that alone was worth the trip! We plan to arrive our Florida condo by the 19th. Pleasant trip with just one terrific storm as we approached a cousin’s home near Mt Vernon, Il.